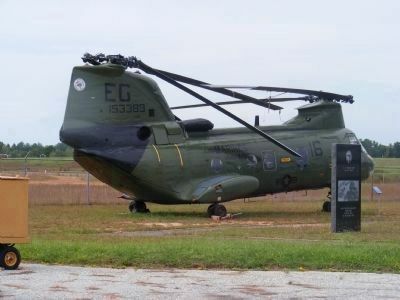 The Boeing CH-46 Sea Knight is a medium-lift tandem rotor cargo helicopter, used by the United States Marine Corps (USMC) to provide all-weather, day-or-night assault transport of combat troops, supplies and equipment. Assault Support is its primary function, and the movement of supplies and equipment is secondary. Additional tasks include combat support, search and rescue, support for forward refueling and rearming points, medivac and Tactical Recovery of Aircraft and Personnel (TRAP). 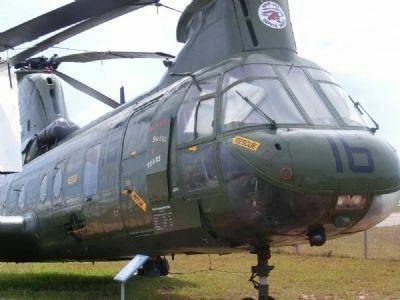 This example on display was built in 1967 and underwent continuous upgrades and modifications during its service life. It was in continuous service in every major conflict with the USMC until it was damaged after a hard landing in Iraq in June 2004. 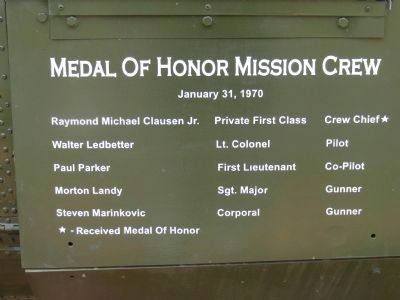 During its service in Vietnam, it was involved in a rescue mission on January 30, 1970 during which the crew chief PFC Raymond “Mike” Clausen’s heroic deeds resulted in his being awarded the Congressional Medal of Honor. Please read the story of that mission on the black granite marker nearby. This display is dedicated to him, his crew and all who flew this type of helicopter. Fuselage Width: 7 ft. 3 in. Location. 35° 13.23′ N, 80° 55.818′ W. Marker is in Charlotte, North Carolina, in Mecklenburg County. Marker can be reached from 1st Flight Drive west of Minuteman Drive, on the right when traveling west. Touch for map. 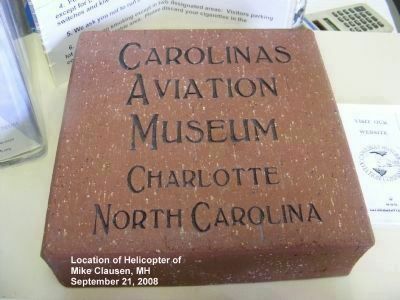 The marker and helicopter are located on the grounds of the Carolina Aviation Museum. Marker is at or near this postal address: 4672 1st Flight Drive, Charlotte NC 28208, United States of America. Touch for directions. (approx. 3 miles away); Mike McCormack (approx. 4½ miles away); Good Samaritan Hospital (approx. 4½ miles away). Touch for a list and map of all markers in Charlotte. More. 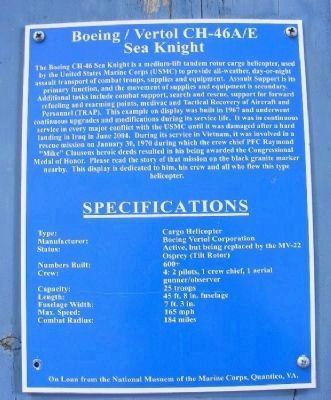 Search the internet for Boeing/Vertol CH-46A/E Sea Knight. Credits. This page was last revised on June 16, 2016. This page originally submitted on March 11, 2013, by Don Morfe of Baltimore, Maryland. This page has been viewed 531 times since then and 11 times this year. Photos: 1, 2, 3. submitted on March 11, 2013, by Don Morfe of Baltimore, Maryland. 4. submitted on January 10, 2013, by Don Morfe of Baltimore, Maryland. 5. submitted on March 11, 2013, by Don Morfe of Baltimore, Maryland. • Bill Pfingsten was the editor who published this page.